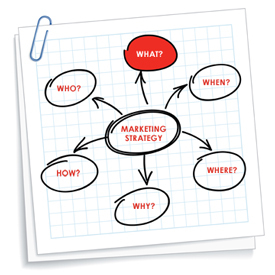 Your marketing strategy is built by understanding the who, what, when, where, why and how. A successful strategy needs to be well thought out, communicated with the entire team, and built for accountability. We have already talked about the “who” in your marketing strategy (target audience) and now it is time to talk about the “what”. Once you have built a target audience profile then you have identified whether they are managers, directors, vice presidents, etc. You know their areas of responsibilities. You know whether or not there is age diversity in the position, racial diversity or whether they are male or female. You should have a basic understanding of who they are, but what can you sell them? We all define our businesses in our own words. My company sells marketing services to professional staffing firms with a focus on marketing strategy, branding, lead generation and market research. That is great and all, but what is the most likely trigger for each of my potential clients. Continuing the example of my business, does the average prospect understand that their strategy is where marketing is failing, not the executions? Do they understand what branding does or how to approach it for their marketplace? We all understand what we want to sell, but we need to approach it with a simple concept of what problem is the target having that I can address. I just used my words for my business and not that of my client. When taking about what I want to sell and merging it with what my clients want, I discover the motivating issues of the marketing strategy. Using the example above of my company, my clients are having a problem envisioning that marketing can help grow their business and they do not see how it will drive return on investment. Thus, my clients want to buy marketing that is focused on driving tangible results with efforts that deliver ROI. Your services can be modified to what they want just as easily, but it is what you do with this content that will matter most. What are the reasons that your prospects and clients want to work with you? What are the reasons that they don’t work with you? Why do they work with your competitors? The answers will revolve around the team that identifies their issues and addresses them the best. Do you currently know what issues your typical client has? Have you ever tried to identify the issues? What is your solution to those issues? Have you sat down and tried to answer these questions? Have you talked to your clients about them?